55/166 David Mumpower Wildly uneven sequel has genuinely hysterical moments. It helps that I love the original so much. 60/60 Les Winan Be Cool be crap (at least the 34 minutes I actually sat through). 72/85 Kim Hollis Vince Vaughn and Andre 3000 make this worth the price of admission. His name is Chili Palmer, and he is one of the best movie character creations of the past ten years. 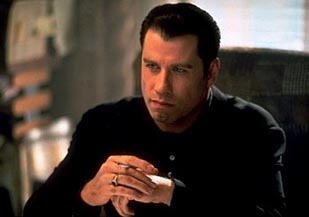 John Travolta, fresh off of his redemption in Pulp Fiction, was for once inspired to really try. Palmer was the joyous outcome of that effort and the driving force behind Get Shorty being one of the best movies of the 1990s. Fast forward to now and Travolta's career has become an endless cycle of several bad movies for every good one. It would then make sense for his agent (technically, that's not Tarantino, but QT is certainly who I mean here) to suggest a return to the role he was...cliche alert...born to play. Elmore Leonard, one of the greatest and most prolific writers of the modern era, was more than happy to oblige. Before anyone bothered to ask, he had already created another world for Chili Palmer to explore. A world even more predatory in nature than the Hollywood studio system. That's right, folks, Chili Palmer wants to be a music producer. To his great inconvenience, becoming the next Phil Spector is not as easy as it sounds. When he happens upon gifted torch singer Linda Moon (Christina Milian) and decides to make her a star, he is in no way prepared for the insanity of an industry that chooses to sue its fanbase. If you're looking for HD televisions to watch your movie collection on, these LCD TVs look great and are priced right. See why everyone is moving to hi-definition today! He encounters difficulties with Sin Russell (Cedric the Entertainer), an already established producer for a lewd rap band. Those are nothing in comparison to the difficulties he faces in dealing with his second signing, Moon's gay bodyguard. This mountain of a man (played by BOP fave The Rock) at first attempts to pummel Palmer before eventually professing a desire to make it in the business himself as a singer.